And we're off again on Fishing in the Discount Bin. I watch a movie and blog about it. You know the drill. This time out, I'm watching The Princess Bride. This is in my notes at December 2, 2018. Ah, The Princess Bride. Sometimes, you never really realize how a film has made itself a home in pop culture until you raise your head, look around, and see everyone quoting it. 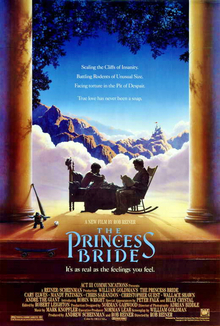 I didn't realize what an impact The Princess Bride made until I started seeing, "Hello. My name is Inigo Montoya. You killed my father. Prepare to die," popping up on T-shirts. I think the first time I saw the film was in school. Growing up in a small, rural town, when the cold winter months came around, my school would usually set up a TV in one of the classrooms over the lunch hour and play movies. They'd show about a half-hour of the film per day, and over the course of a week, you'd see the whole film. I keep saying I'm going to try to re-create that experience someday. Create the "Intramural Movie Club" and watch a film just a half-hour per day. Other notable films I watched that way in my youth are Star Wars and Back to the Future. The problem with watching The Princess Bride like that is I was forever coming in in the middle of it. I think it was about the third or fourth time I watched it was when I finally caught the framing story about how it's just a storybook and a grandpa is reading it to his grandson. Definitely brought a whole new wrinkle to it. For the longest time, I thought it was just a fun adventure tale. I remember those early days of DVD, when it was first released. I was still living at home, in those first few days out of college. Loved movies so much that I was known to blow entire paycheques on new DVDs at HMV in West Edmonton Mall. I don't know if you remember HMV when it first opened 20 years ago. DVDs and movies occupied the south corner of the top level. In the DVD section, up on the wall, they had one of the very first plasma-screen HDTVs. I was meeting up with a friend to go catch a movie. HMV became our go-to meet up spot. We were hanging out, I looked up at the HDTV, and saw that The Princess Bride was coming on. I turned to my friend and said, "Forget the movie, let's just stay here and watch this." We did go see the movie. We saw Shrek. Shrek and The Princess Bride do share a few similarities, in that they're both post-modernist spins on fairy tale tropes. Shrek does it by being sarcastic and self-referential. However, The Princess Bride is nothing but love. Anyway, I'd been putting it off getting it for the collection for the longest time, but then I saw it just got a spiffy new Criterion edition. And as those Criterions really class-up the Blu-Ray shelf, I figured I'd grab the Criterion. I won't re-hash the plot, as I'm sure you've seen it a billion times. Let me just say that it holds up really well, and it's still as lush and romantic as you remember. Watching it again tonight, about the only thing that really dates it is that very-1980s synthesizer score. The cast, still magnificent after all these years. Too bad the swashbuckler is no longer a valid film genre. Between this and Robin Hood: Men in Tights, Cary Elwes would have dominated the genre. I see Robin Wright gets an "and introducing..." credit. Was this her first film? Wikipedia says it was her second, and she did a ton of TV beforehand. But still, I'm reminded of a meme I saw going around a few years ago. It was a picture of Wright as Princess Buttercup alongside a picture of Wright as the Amazon general in Wonder Woman, and the caption read, "I've grown up to see all my princesses become generals." The Princess Bride is still a lush and lovely film. I can hardly wait to delve into the bonus features. The film was written by William Goldman, who also recently passed away. He's considered to be one of the greatest screenwriters ever, and his book Adventures in the Screen Trade is one of the best books about writing, and the only one that's specifically about writing for movies. Anyway, Goldman based the film on his own novel, and it's used as a textbook case on how to adapt a book for the screen. To help illustrate this, the Criterion edition actually put together a running commentary made of excerpts from the audio book of the original novel, so you can see how it was changed for the screen. One of the more unique bonus features I've run into in a long time.